There’s a difference between how to do things, and how things work. If you are new to AbtracOnLine, be it coming to Abtrac from our desktop version or another system we have a few pointers to ensure you get off to the best possible start. This article contains a lot of our tips and tricks about the Abtrac interface. When you are getting started it’s worth a read to learn all the little tweaks and tricks to ensure you have Abtrac looking, feeling and working in a way that suits you. How to get the data in a certain page looking just the way you want it to with user settings. All you need to run Abtrac is a contemporary device with access to the internet. Although if we were being fussy our geeks do recommend you run AbtracOnLine in Google Chrome- it’s the fastest browser available – and you may as well use the best, right? To create a desktop and taskbar icon click on the link below to open the AbtracOnLine website. Choose the Chrome Menu (three horizontal bars in the upper-right corner) > More Tools > Add to Desktop. 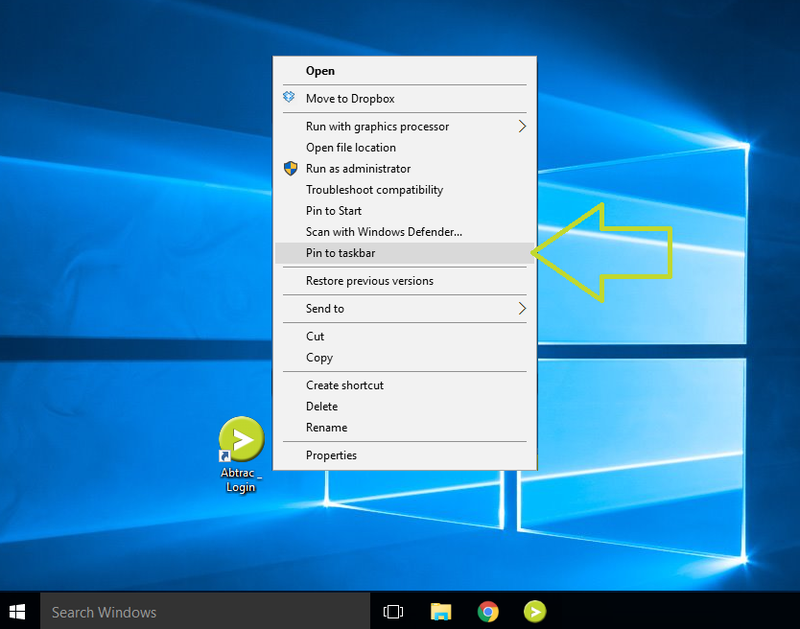 Once you have a desktop icon, you can right click from the desktop to pin the application to the taskbar. The Abtrac main menu navigates all the primary pages for Abtrac. Some pages (like Project details) have an additional secondary menu. Within many screens and tables in Abtrac you can right-click to jump to additional relevant pages. You can also open multiple Abtrac pages at one time, by using your browser tools. Right click on any menu option and choose open in a new tab or window. 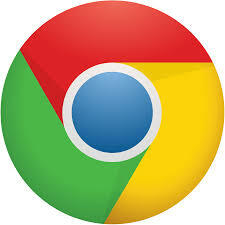 Your browser navigation bars can also be used to refresh and go back. *Please Note – If you are opening multiple windows take care. Unless your current page has updated/refreshed you might not be seeing data that has been recently entered on another page. Use your browser bar to keep an eye out for new windows, pop-ups and downloads. Reports will open in a new tab by default so keep an eye out for new windows (and multiple windows) if you are running several reports or re-running variations of the same report. Abtrac uses Pop-ups for some notification messages and data checks like the one below. In most cases AbtracOnLine is ready to go with Google Chrome and doesn’t require any additional configuration, however on occasion a browser may block AbtracOnLine pop-ups and downloads. If you notice this icon in your browser bar then you’ll need to add abtraconline.com to your browser exceptions – follow this link for instructions. You need to save every entry. 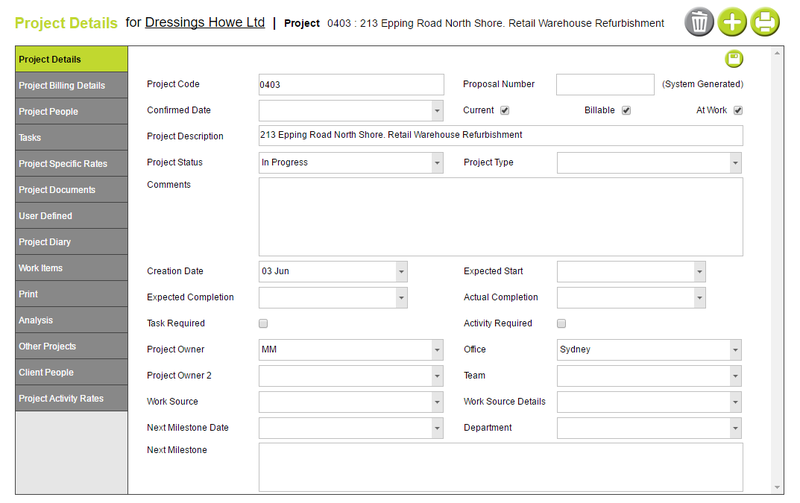 When entering data you need to save your record before moving onto the next field or the next screen. If you are working in a table your save button will be either within the row you are editing, or within the table footer. In other edit/entry screens your save button is usually either top or bottom right. Hover for tips on what a button does. Other buttons represent similar actions across all the pages. You’ll see add, delete, and edit, expand and print buttons on most screens too. You can hover your cursor over a button to see it’s function on any specific page. 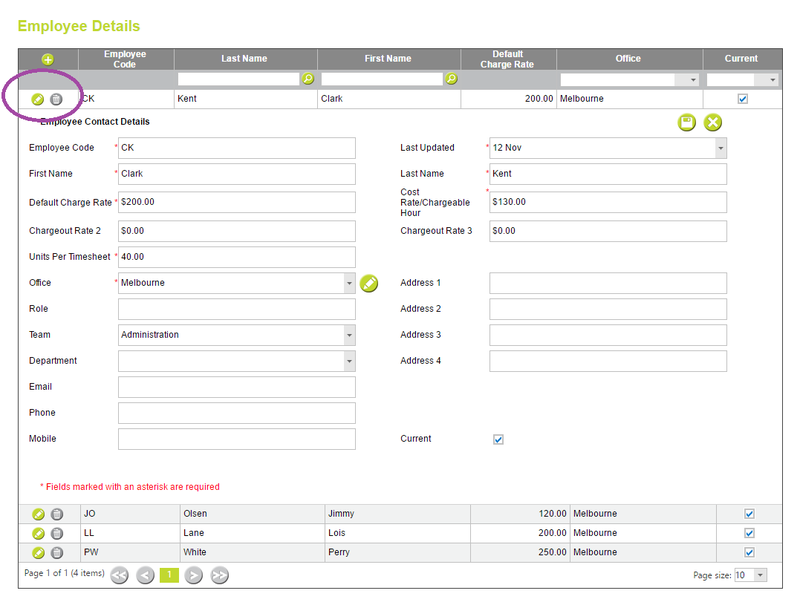 Some buttons don’t have a hover tip – in the image above when you choose Print Invoice you get a choice of print options. There are three main types of data screens in Abtrac. Some pages display data much like a report. Information can be entered directly into these screens. When adding a new record the required fields have a red asterisk*. 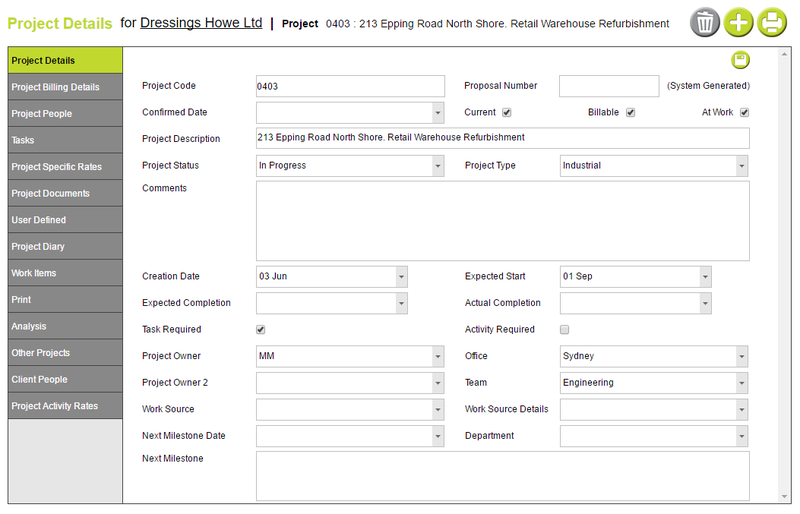 If the form contains a drop down option (Like Project Type below) you can add to these lists from Administration > Maintenance. Others pages display data in a table(grid), but to enter data you must pop out the editin/2016/07/edit-form.pngselect Edit Record (the pencil button) to expand the entry and open the editing form within the table. Others pages allow you to enter data within the table (grid) directly. Sometimes you are required to save each row, in others you can save all the row changes for the table at once (it depends on the page and data involved). If a row/rows within a table are unsaved then they will be highlighted green, until the record is saved. The support team are often asked simple questions about searching, filtering and getting things just right – particularly when you are starting out using AbtracOnLine. Follow this link for tricks to filtering and sorting, and a few handy ‘everyday use’ tips for using Abtrac Grids. This entry was posted in Getting Started, IT Tips & Requirements, Tips & Tricks and tagged browser, chrome, data grids, navigation, pop-ups, save, tables by Jen. Bookmark the permalink.